In New York City 81 people died in traffic accidents related to speed last year. Even though this number is one of the lowest ever recorded, speeding remains the greatest contributing factor in traffic fatalities in the city. 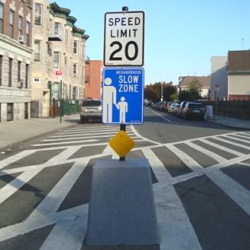 In a continuous effort to make the city safer and reduce traffic fatalities, Mayor Bloomberg and Traffic Commissioner Sadik-Khan announced this week that the New York Neighborhood Slow Zone program would be expanded to 15 new communities. In a previous post in May we announced that communities could apply for Neighborhood slow zones. The City received a total of 74 applications and selected 15 of them based on criteria such as crash history, community support, proximity of schools, and senior and daycare centers. The 15 communities selected are: Alphabet City in Manhattan, Norwood in the Bronx, Clinton Hill/Bedford Stuyvesant and Brownsville in Brooklyn, and Jackson Heights, Queens in 2014; Sunnyside Gardens/Woodside and Sunnyside in Queens, Crown Heights, Brooklyn, Parkchester in the Bronx and Manhattan’s West Village in 2015; and Midland Beach in Staten Island, Brooklyn Heights and Prospect Heights in Brooklyn, Westchester Square in the Bronx and Hudson Heights in Manhattan in 2016.